A race medal and swag from a race should be special, something that commemorates your experience for completing the race at an iconic location. For every race, we go out of our way to create spectacular medals, shirts, goodies and little surprises that runners love. When you cross that finish line and receive your medal, we want you to think "WOW! That was an amazing race and this medal is spectacular!" Below is a preview of the race swag from past years, each year will feature an original design and unique theme. Register today and earn yours at the race! 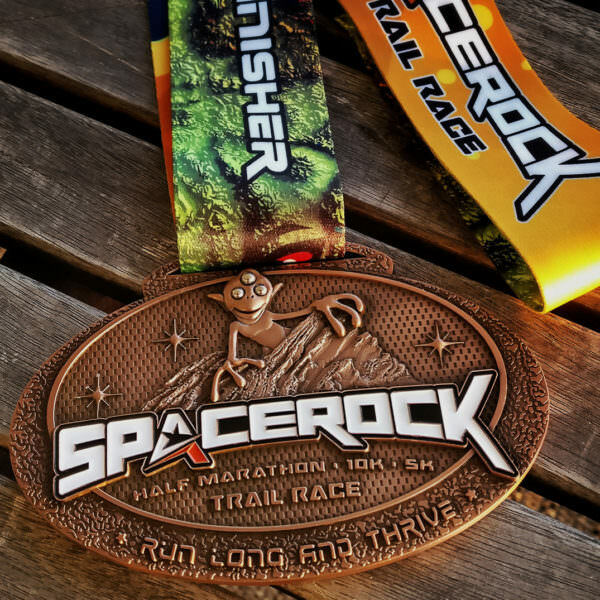 Here's a sneak preview of the 2018 SPACEROCK Trail Race swag that participants will receive. This year we have a special 3-eyed visitor coming to visit Vasquez Rocks and watch over the SPACEROCK Trial Race. Guaranteed to be a favorite among runners! 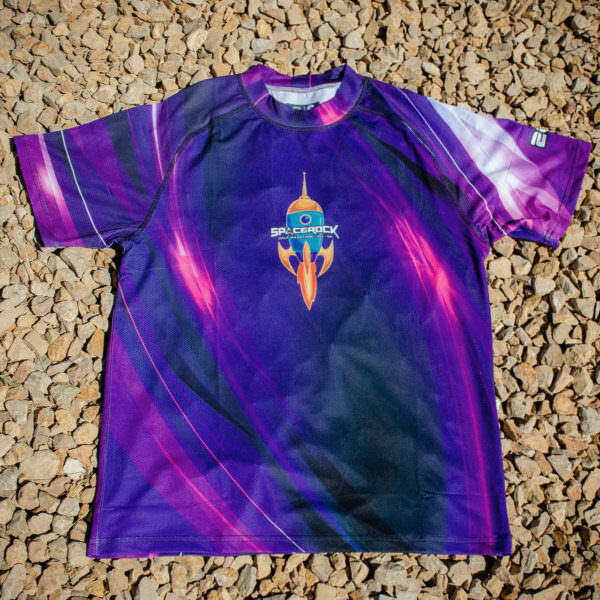 An electrifying design in deep purple featuring a rocket ship with the SPACEROCK Trail Race logo on the front and on the back it says "I believe to run long and thrive with world class race crew." 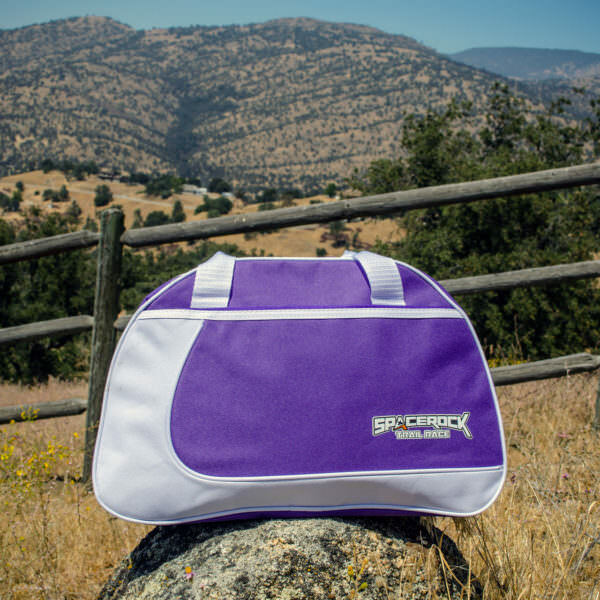 We are bringing back the same bag style as the past two years, but this year is in a beautiful purple color. 1st place male and female finishers of each distance receive this beautiful Vasquez Rocks sculpture that will also have a special visitor climbing on it, but we can't show you until race day! 10K and Half Marathon participants will pick up a unique souvenir pin during the race as proof of reaching the half-way point and returning to the finish line. Pins will be revealed at the race, sign up to earn yours! 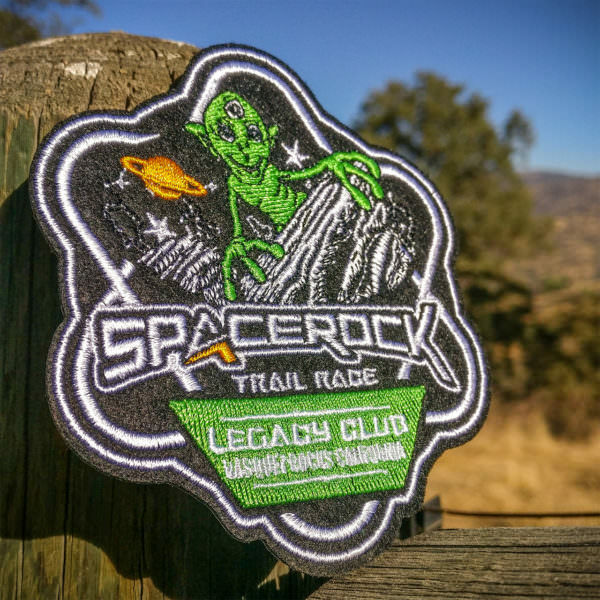 We honor our legacy runners that run each year, they will receive this awesome SPACEROCK Trail Race patch. 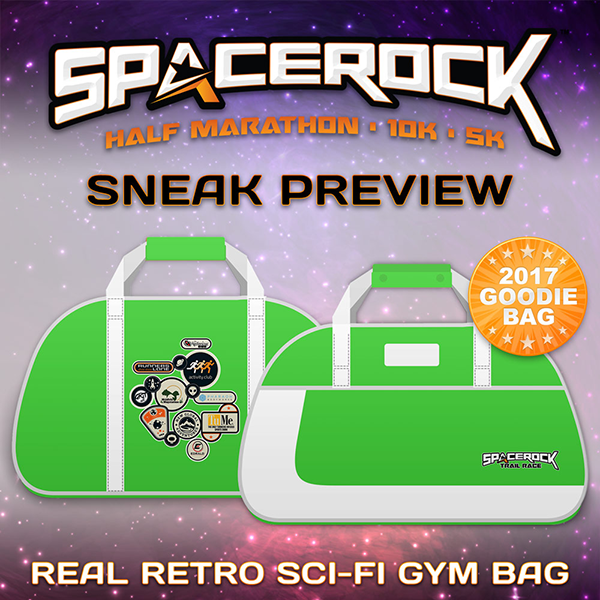 Here's a sneak preview of the 2017 SPACEROCK Trail Race swag that participants will receive. Featuring a unique double-sided design combining a detailed Vasquez Rocks with the space sci-fi theme and our celebrity alien Sixsixone. 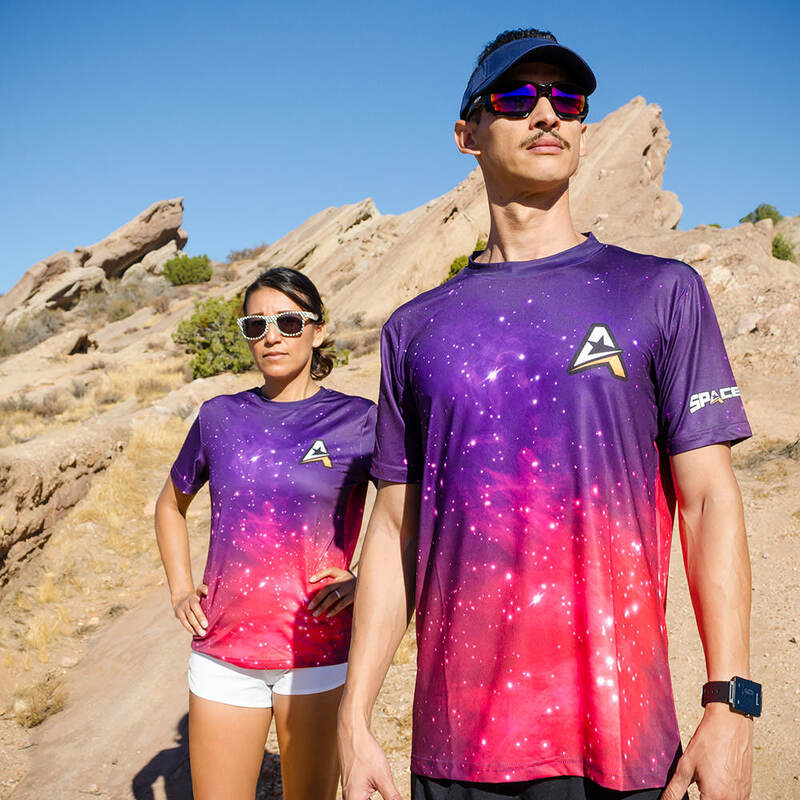 Be out of this world when running in this spectacular galaxy race shirt featuring our race sponsors on the back. We are bringing back the same bag style as 2016, but now in a vibrant alien green. 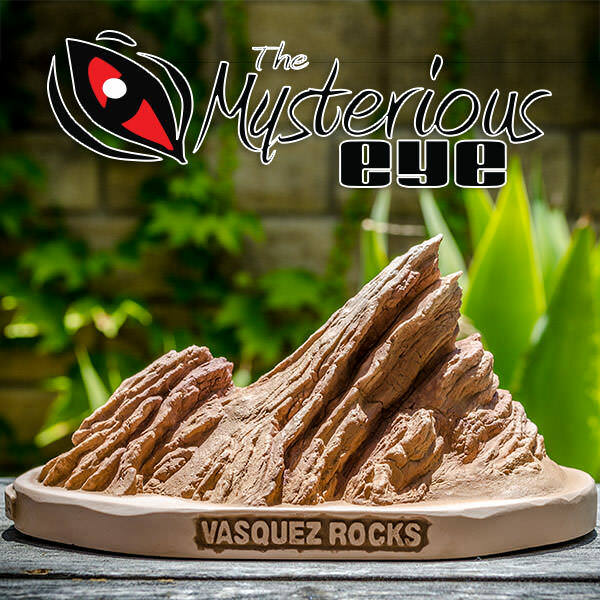 1st place male and female finishers of each distance receive this beautiful Vasquez Rocks sculpture on a custom SPACEROCK Trail Race base. 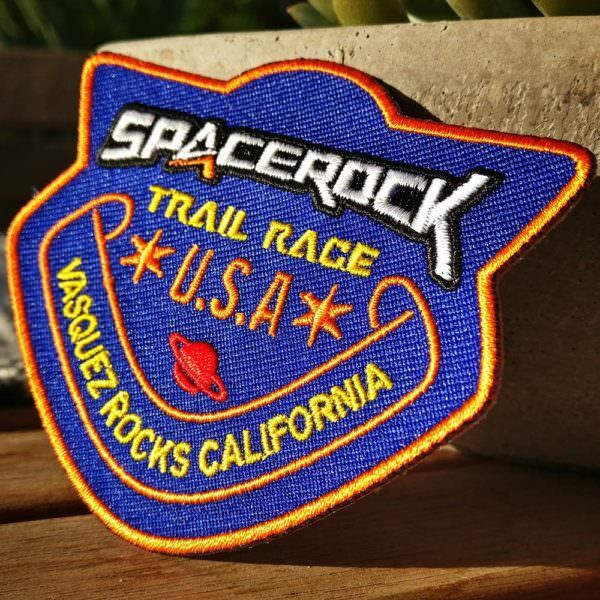 To honor our legacy runners that run each year, they will receive this awesome SPACEROCK Trail Race patch. A spectacular limited edition alien green shirt for the 2017 race featuring Sixsixone alien. Now available to purchase! 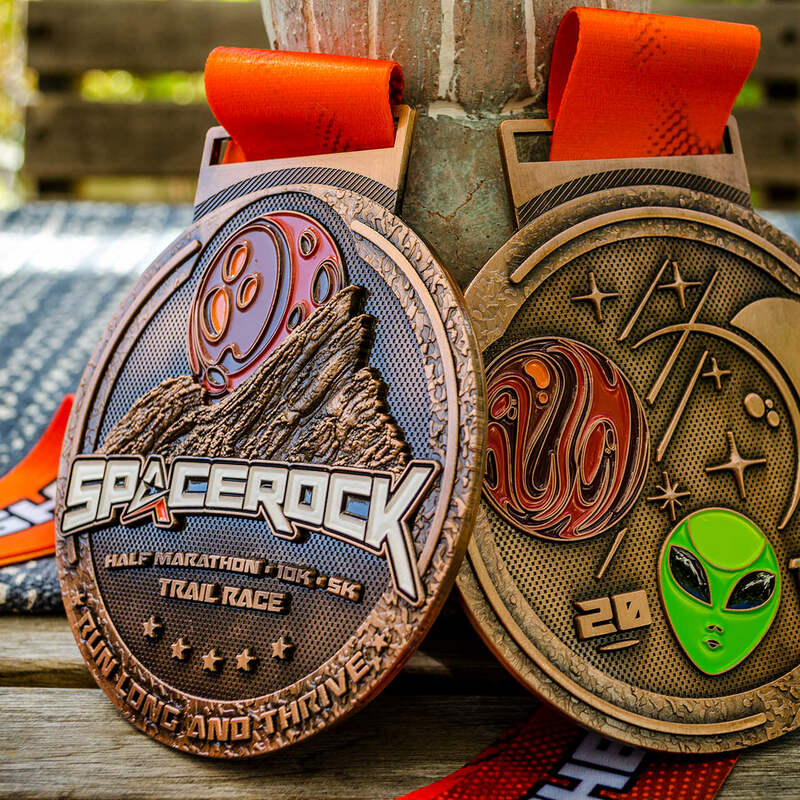 For the inaugural SPACEROCK Trail Race in 2016, participants earned a spectacular medal, race shirt and one of the best goodie bags from a race, a retro sci-fi bag that is perfect for your running gear! 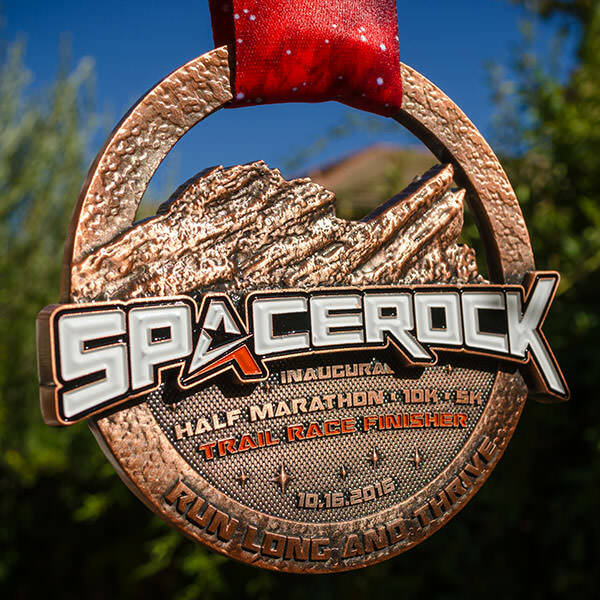 A hefty brass medal design featuring the iconic Vasquez Rocks and SPACEROCK logo with a galaxy ribbon. 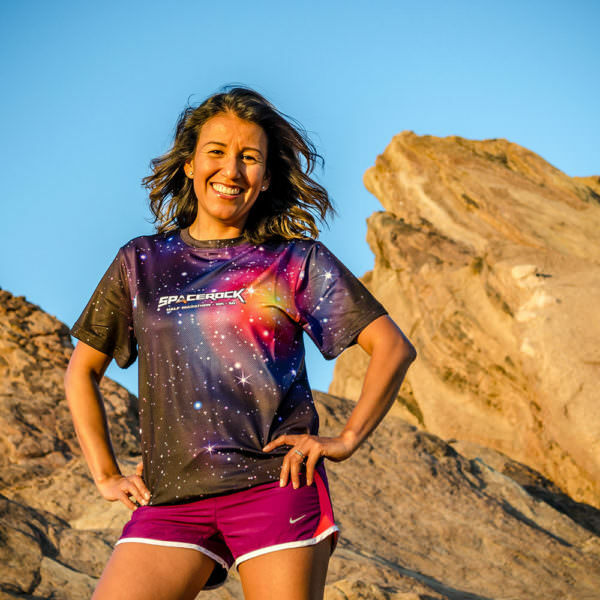 Combining the iconic Vasquez Rocks with the galaxy in a full print design that wraps around from back to front. 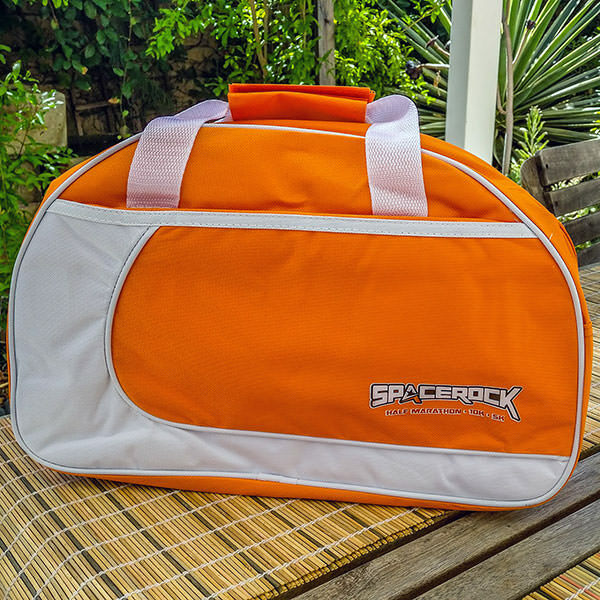 A retro sci-fi gym bag in bright orange and white colors featuring the SPACEROCK logo and sponsors. Half Marathon & 10K runners received a surprise button that they picked up at the half way point of their race. Just a little thank you for being a part of the race! 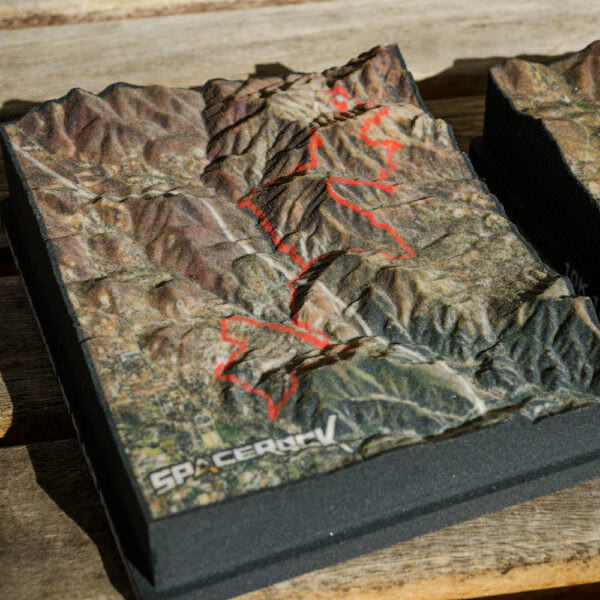 1st place male and female finishers of each distance received a custom 3D printed map with the course they ran. Limited 2016 finisher shirt was available for purchase featuring a full galaxy design with the SPACEROCK A icon on the front, logo on the sleeve and slogan on the bag.